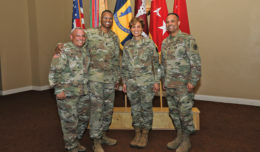 From Left: Lt. Col. Brad Fisher, Garrison Director of Emergency Services, Col. Matthew Moore, Chief of Staff, National Training Center; Kenneth Smith, Fort Irwin Fire Department Chief; Patrick Reid, Fort Irwin Fire Department AED Manager. 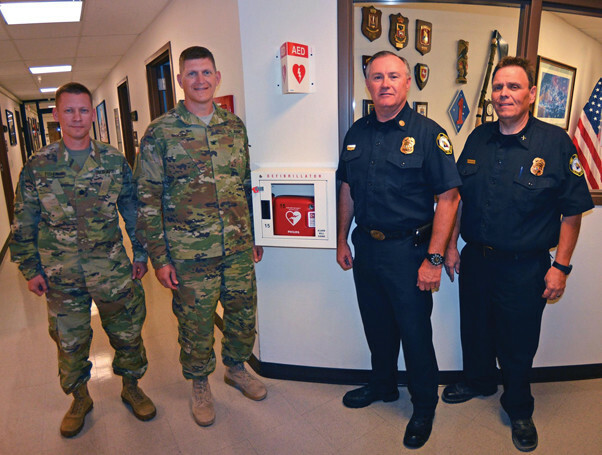 The Directorate of Emergency Services boosted response time for cardiopulmonary emergencies by installing over 70 Automated External Defibrillators (AED’s) across the installation, Nov. 4. The AED’s will be installed in facilities that are known to have foot traffic and all devices will be installed by the end of this month. 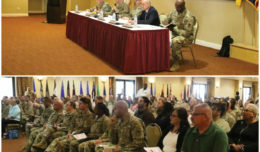 With around 25,000 Soldiers, Families and civilians working and living on Fort Irwin, the potential for a cardiopulmonary emergency exists. 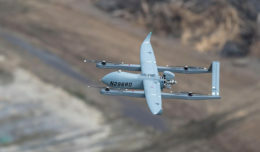 According to Kenneth Smith, Fort Irwin Fire Department Chief, in 2015 the installation experienced thirty-two “heart related” emergency calls. Chief Smith said paramedics on the installation successfully used a defibrillator and saved two individuals, one at the Hazardous Material facility in 2000 and one at the Goldstone complex in 2011. The AED’s found in various location on the installation are fully automated and will not jolt a person without a shockable rhythm. In facilities where they’re placed, Stewart will be training building managers and staff on first aid, cardiopulmonary resuscitation procedures and proper AED techniques. Stewart and building managers will perform daily and scheduled checks to insure the AED’s are fully functional when needed to save a life. “Believe it or not, there’s no training needed to operate these AED’s. When you hit that start button, it will prompt you through everything,” said Stewart.